It is assumed that operation can be performed with optimum personnel while maintaining JIT. We have been supporting social infrastructure and IT platform for more than 60 years. We provide a variety of services to answer your requests by "activities of customer base closely tied to customer's site" and support business. In recent years, we have focused on outsourcing business, there is no support base nationwide and it is impossible to respond promptly, because after sales service is also concurrently held by sales person, we can not focus on original sales activities nationwide.By utilizing a service base network, we are contributing in solving customer problems and increasing sales. It was necessary to respond to the anticipated labor shortage in the future and work to secure further labor force. Currently, it is assumed that the proportion of over 50s in all employees accounts for 28.3%, and in 2026 it is 62.6%, which accounts for a sharp increase in the proportion of over 50s. For that reason, we had to look forward to the future from this stage and take action. 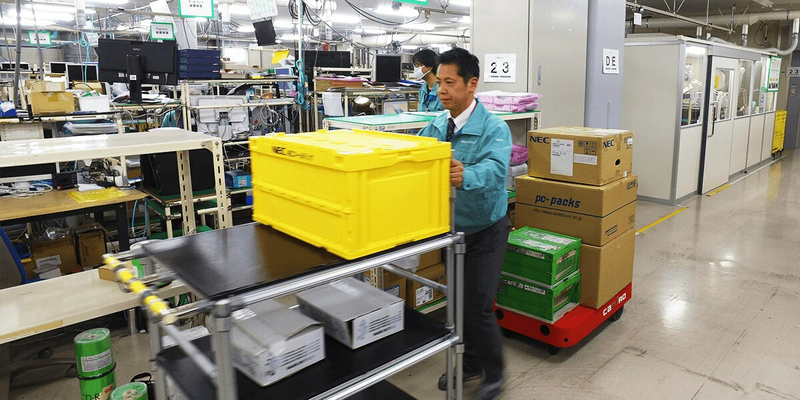 At the Kawasaki Technical Center, the core logistics center that introduced CarriRo, we are continuously reviewing work efficiency and facilitation, including the adoption of the Toyota production system from 2005, with a view to aging in the future. We were seeking measures to improve efficiency. There are two main reasons for introducing: 1. Easy operation 2. Introduction can be done without changing the existing environment as much as possible. 1. ​Easy operation makes CarriRo to stand out. It can be operated by anyone especially the elderly people. 2. ​CarriRo is a big appeal to the point that it can be introduced without changing the existing environment as much as possible. Where large-scale robots were introduced, we have to make substantial line changes and placement changes, but it was extremely helpful to be able to introduce easily CarriRo without drastic change. We are aiming to optimize the operation of inter-process physical distribution operation at Kawasaki Technical Center. Currently, we are introducing it in some areas and we anticipate efficiency of workers. Concretely, we had conventionally circulated different routes at the same time by multiple workers and by introducing the CarriRo we can carry loads up to 3 times as much as the conventional one at once, so we can integrate the route, maintain JIT even though it is supposed to be possible to operate with the optimum personnel. 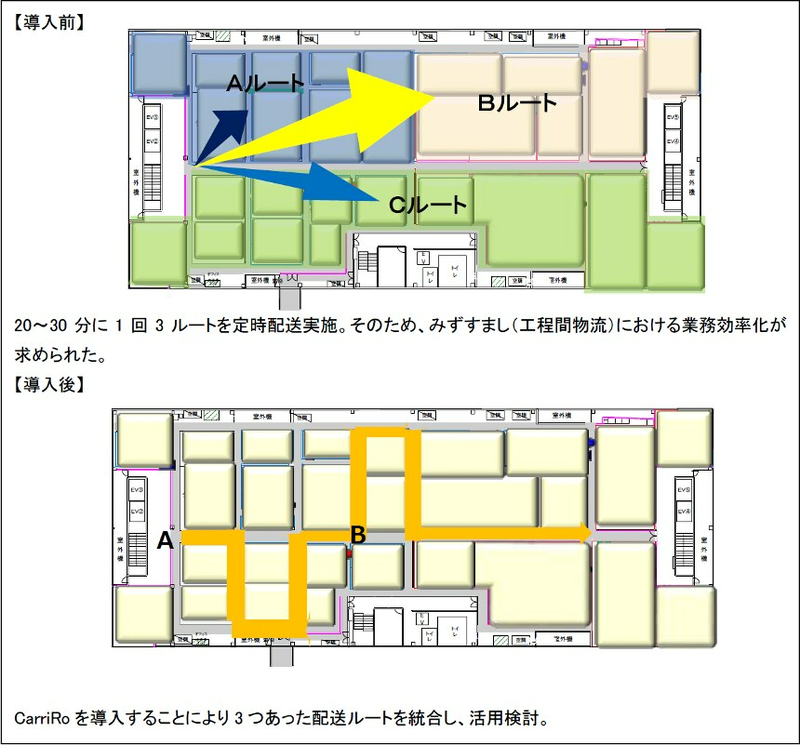 Currently, only a part of the floor of the Kawasaki Technical Center utilizes CarriRo, but we are planning to introduce CarriRo operation throughout Kawasaki Technical Center. By using CarriRo and RFID and other technologies together, we will look for ways to make business operations more efficient by visualizing warehousing / dispatch / stock management etc. Eventually, we will aim for a warehouse that is fully automated which allows people and robots to work efficiently.